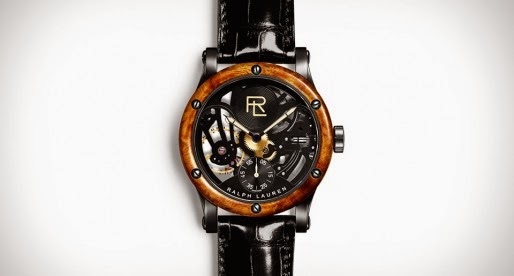 The new Ralph Lauren Automotive Skeleton features an open-worked, hand-wound mechanical movement. The caliber RL1967 is the first open-worked movement Ralph Lauren has ever presented. The depth of the movement is accentuated with a black finish on the plate and bridges, which offers a subtle contrast to the black finish on the stainless steel shot-blasted case. The letters “RL” at 12 o’clock, on a circular element slightly offset from the mainspring barrel, are a proud statement of creative integrity. The steel and brass elements of the gear train, as well as the large balance oscillating at 18,000 vph and the sword-shaped, black oxidized hands coated with beige Super-LumiNova® further enrich the visual experience. The composition is framed by a lustrous amboyna burl bezel.